Gerbsman Partners (www.gerbsmanpartners.com) has been retained by Palyon Medical Corp. (www.palyonmedical.com) to solicit interest for the acquisition of all, or substantially all of Palyon Medical Assets. 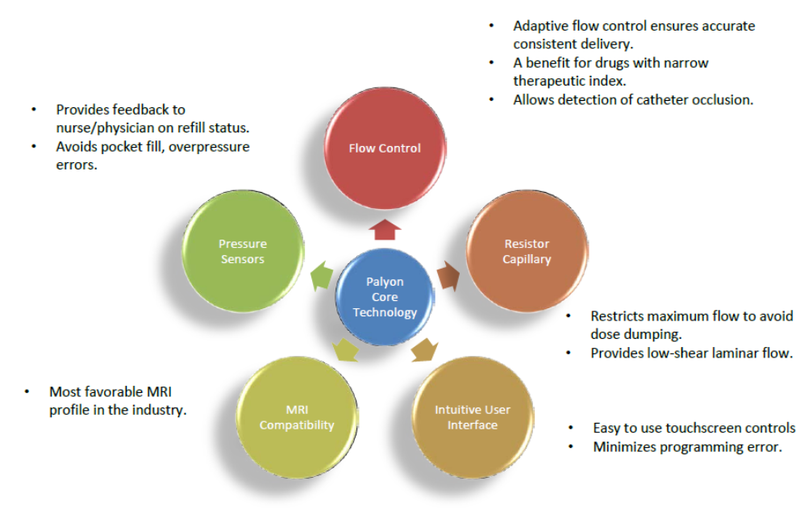 Headquartered in Santa Clarita, California, Palyon Medical was in the process of developing the P1005 Programmable Implantable Drug Delivery System and the M21 Constant Flow Implantable Drug Delivery System, drug delivery systems primarily for the treatment of spasticity and intractable pain. The company has identified applications of the technology for other medically important and commercially attractive conditions where chronic, localized drug delivery address unmet medical need. The core technology platform was originally developed and acquired from Fresenius Medical in Germany. Palyon Medical has a small wholly owned subsidiary in Bad Homburg, Germany that has been involved the development aspects of the pump and is in the process of being shut down. The information contained in this memorandum relating to the Palyon Medical Corp. Assets has been supplied by Palyon Medical Corp. It has not been independently investigated or verified by Gerbsman Partners or their respective agents. Gerbsman Partners, and their respective staff, agents, and attorneys, (i) disclaim any and all implied warranties concerning the truth, accuracy, and completeness of any information provided in connection herewith and (ii) do not accept liability for the information, including that contained in this memorandum, whether that liability arises by reasons of Palyon Medical Corp.s’ or Gerbsman Partners’ negligence or otherwise. Any sale of the Palyon Medical Corp. Assets will be made on an “as-is,” “where-is,” and “with all faults” basis, without any warranties, representations, or guarantees, either express or implied, of any kind, nature, or type whatsoever from, or on behalf of Palyon Medical Corp. and Gerbsman Partners. Without limiting the generality of the foregoing, Palyon Medical Corp. and Gerbsman Partners and their respective staff, agents, and attorneys, hereby expressly disclaim any and all implied warranties concerning the condition of the Palyon Medical Corp. Assets and any portions thereof, including, but not limited to, environmental conditions, compliance with any government regulations or requirements, the implied warranties of habitability, merchantability, or fitness for a particular purpose. Palyon Medical develops and manufactures implantable drug delivery systems for the treatment of unmet medical needs where chronic, localized delivery is required. The initial applications of the technology are in the fields of chronic pain and spasticity. Other potential indications include pulmonary hypertension, diabetes, lysosomal storage disorders and other neurodegenerative diseases. Spun out in 2003 from Fresenius Medical, the technology has been proven in over 100 patients. Palyon has an extensive patent portfolio with 21 US issued, 20 pending, 11 issued Europe and 2 active EP patents. In 2009, Palyon Medical raised $21 MM in Series A funding. The proceeds were targeted to complete the transformation of Palyon’s constant flow pump into a programmable pump for the US market. Baird Venture Partners led the round with Hambrecht & Quist Capital Management, Fountain Healthcare Partners, BB Biotech Ventures, Cross Atlantic Partners and Arcus Ventures also participating in the transaction. In 2013, the company raised an additional $17 million in Series B funding, from the current investors and one additional individual investor to facilitate EU registration and initial commercialization. In 2013 Palyon conducted a single center clinical pilot study in Austria. See Regulatory and Clinical Assets section, below. The trial, scheduled for 10 patients was closed after 7 patients were enrolled due to suboptimal delivery accuracy. Palyon has identified what it believes is the root cause of this flow rate issue and has implemented design and controls to mitigate such an occurrence in the future. In December of 2014, the Board of Directors of Palyon Medical made a strategic decision to maximize value at Palyon Medical and as such, have retained Gerbsman Partners to do a “Date Certain M&A Process”. 1. Manufacturers in this market segment have dominated the implantable pump industry but have experienced recalls and other challenges related to device design. In our opinion, there is a need for a safer more consistent pump which leads to a significant commercial opportunity. To the best of our knowledge, other competitors in this field have made incremental advances but lack the safety and performance advantages that Palyon’s core technology provides. 2. Palyon is able to offer a flexible platform that supports both constant flow and programmable pump products based upon a common core technology. 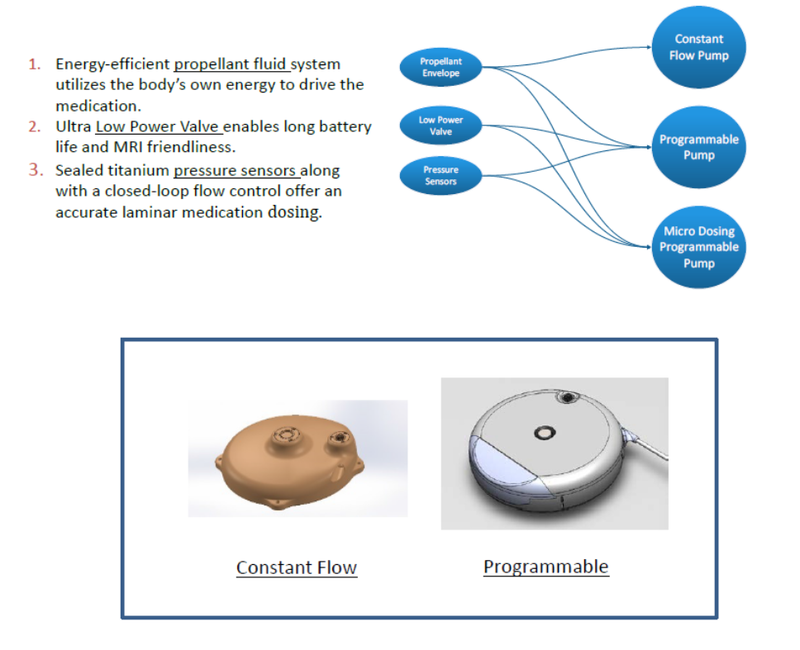 Palyon has also demonstrated the viability of its implantable pump technology for insulin delivery. Palyon Medical has a strong and broad patent portfolio, which initiated through transfer of assignment from Fresenius Medical and subsequently grew through internal innovation management process. Palyon also has significant international patent coverage, with protection extending in various countries including US, Germany, Austria, France, Great Britain, Japan, Canada and Mexico. · 11 issued patents, with varying coverage in Germany, France, GB, Spain, Italy, Japan etc. * Unparalleled accuracy from 100ul/day to 2000 ul/day due to flow monitoring and feedback control. * The target 20 ml refill volume is modular and extensible to 40 ml. * Able to detect catheter occlusion and pocket fill events. * Palyon pump’s pressure sensors provide capabilities unique among implantable pumps. t Maximum refill safety – sensors confirm presence of needle in refill port, avoid risk of potentially fatal “pocket fills”. t Generates alert if catheter patency is compromised. t Propellant drive and resistor capillary produce laminar flow, improved accuracy and stability of drug delivery. * Modular with common design elements with Programmable Pump. * Current target is 20 mL refill volume; modularity allows expansion to 40 mL. * Propellant and resistor technology ensures non-pulsating flow. * Lightest and smooth contours with use of either Titanium or Polymeric material. * Safety guard and radio-opaque catheter access port. * Inherent low-pressure feedback on refill port to avoid pocket fills. The marketing assets of Palyon Medical provide detailed business intelligence for companies developing competitive technologies for the treatment of spasticity and intractable pain. · Companies focused on developing therapeutics for localized delivery to specific regions in the body – e.g. liver, brain, spinal cord, pulmonary veins etc. · Drug delivery companies seeking to broader their technology offerings and product development capabilities. · Orthopedic / Neurostimulation companies seeking to broaden their product offering to their target customers. Palyon Medical has applied a strategy to combine internal engineering resources for product development, in collaboration with external contract manufacturing. Hence Palyon physical assets reside at both locations, at Palyon facility in Santa Clarita as well as at Palyon Contract Manufacturer in San Jose, California. These equipment are used in manufacturing, testing and product development. A partial list of physical assets used in manufacturing includes two autoclaves, two large incubators, highly accurate scales with isolation chambers, environment chambers/ovens, packaging and forming machine from Medipack, ultrasonic cleaners, UV curing equipment, pressure sensors, pressure controllers, vacuum pumps and chambers, microscopes, syringe pumps etc. A partial list of physical assets used in product development includes multiple pressure sensors and controller, National instrument equipment, soldering equipment, ovens, Sensirion flow measurement, various lab tools and gages, large glove box, multimeters, sound pressure meters, ultrasonic cleaner, various injection molds, sensors and actuators, microscope with built-in camera, test fixtures etc. Palyon Medical sponsored an open label, prospective, pilot study on the use of the Palyon Model P1001 Programmable Pump System to deliver preservative-free morphine sulfate, for the treatment of patients with chronic pain that has not responded to other types of treatment. Through this study Palyon Medical planned to characterize the safety and performance of this drug delivery platform. The study enrollment plan included of up to ten patients. The primary study endpoint was the proportion of subjects free of serious adverse events at six months after implant of the P1001 implantable drug delivery system. Enrollment started in June 2013; seven subjects were enrolled. Of these, three received a pump implantation. In addition to the three enrolled patients who received a pump implantation, three observational patients (not enrolled in the study) were implanted with Palyon pumps prior to the start of the study. A total of six patients were implanted with a Palyon pump. Five Serious Adverse Events (SAEs) were observed in enrolled subjects. Three of the SAEs in enrolled subjects involved over-delivery of medication to the subject. As a result of over-delivery, the pump reservoir became empty sooner than expected, causing the subject to experience withdrawal symptoms. One observational patient also experienced this event. In all cases, medication successfully resolved the issue. The other two Serious Adverse Events in enrolled subjects were also successfully resolved. No adverse events were observed in the four subjects who were enrolled but did not receive a pump implantation. All enrolled subjects with implanted pumps received drug therapy from the device. Subjects typically experienced expected drug-related adverse events, such as restlessness, dizziness, headache, nausea, and other symptoms, that are commonly seen in patients who are just starting therapy with a drug pump. No subject or observational patient experienced an unexpected adverse event. All refill procedures were completed successfully. No life-threatening events of any kind were observed. However, device-related problems caused pump explant in all cases where a pump was implanted. These device-related problems included premature battery depletion in each of the three observational patients. This technical issue was successfully addressed by the time the next three subjects were implanted. Because implanted pumps did not perform as expected, Palyon stopped the study on 26 Sep 2013. By the end of September 2013, all implanted subjects were explanted. All subject participation was withdrawn. All subjects and observational patients continued to receive alternative therapy at the study site. The study is closed. All filings associated with study closure have been completed. Palyon believes that the technical issues observed during the clinical study are well addressed in the improved pump design and quality system procedures represented by the P1005 system. Over 1.5 years of real time test data demonstrated that the solutions put in place to solve the premature battery depletion were effective. Palyon Medical implemented a full Quality Management System per EN ISO 13845:2003. In 2013, Palyon received certification of compliance to this standard from LNE/GMED, a French Notified Body. As a cost-savings measure, Palyon allowed this certificate to expire. Palyon believes that re-certification could be easily achieved following a Quality System audit by a Notified Body. Achieving CE-mark for Palyon’s next-generation pump system, such as the P1005, will depend critically on completing the device design and testing, which is in progress. Following completion of the device technical file, examination of the technical file by a Notified Body will be required for CE certification. o Mike has more than 40 years of comprehensive experience working with public and private pharmaceutical, biotech and medical device companies in the U.S. and Europe. He has experience in the areas of R&D, business development, and corporate finance, including involvement with over 100 licensing transactions and corporate acquisitions. Previously, Mike served in senior positions with Marion Laboratories (now called Marion Merrell Dow) and Elan Corporation. He has served on the Boards of 14 public and private companies and also on the Advisory Boards of several venture capital firms. o Manish has over 20 years of experience in a broad range of industries, with organizations including Palyon, Advanced Bionics and Siemens. His role spans technical leadership, program management and manufacturing. He has successfully led many innovations, with 3 issued and 15 pending patents in fields of digital control, acoustics and implantable insulin pump. While leading the research and development teams, his particular focus has been on design, analysis, manufacturability and reliability. o Over 25 years of experience in the medical device industry, developing both Class II and III devices; serving in engineering leadership and program management roles at companies such as Medtronic Minimed and St Jude Medical as well as smaller companies such as Palyon Medical and Chad Therapeutics. He has experience in electrical/software driven devices such as surgical generators, oxygen conserving devices, implantable cardio defibrillators and external as well as implantable pumps. o Chris has worked in medical device companies for over 20 years, applying his technical expertise to all aspects of the product life cycle. He developed state-of-the-art quality systems covering all aspects of quality and regulatory functional deployment, and has directed pivotal device trials in the USA and EU. His expertise includes Class II/III devices in multiple medical specialties, covering surgical tools, disposables, active and passive implantables, and medical electrical equipment. He has served as VP/Director extensively in start-ups (Palyon, Spectranetics, Lasertechnic, Cymer) and in large companies (Boston Scientific, J&J). Palyon Medical Corp. reserves the right to, in its sole discretion, accept or reject any bid, or withdraw any or all of the assets from sale. Interested parties should understand that it is expected that the highest and best bid submitted will be chosen as the winning bidder and bidders may not have the opportunity to improve their bids after submission. Palyon Medical Corp. will require the successful bidder to close within a 7 day period. Any or all of the assets of Palyon Medical Corp. will be sold on an “as is, where is” basis, with no representation or warranties whatsoever. All sales, transfer, and recording taxes, stamp taxes, or similar taxes, if any, relating to the sale of the Palyon Medical Corp. Assets shall be the sole responsibility of the successful bidder and shall be paid to Palyon Medical Corp. at the closing of each transaction.